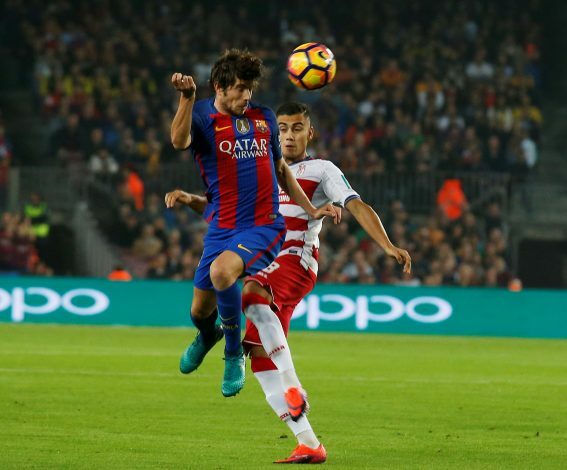 Sergi Roberto is set to make a decision about his Barcelona future this week, as he feels that the arrival of Paulinho from Chinese club Guangzhou Evergrande could limit his chances of featuring in the playing XI. Having started his career as a midfielder, Roberto was shifted to the right-back position after the departure of Dani Alves to PSG last season. With Aleix Vidal failing to make a notable impression for the team, Roberto was used as a first team right-back by then manager Luis Enrique, and the Spaniard put in some stand-out performances on the right side, registering 6 assists in 32 appearances. Despite excelling at the position last campaign, it seems that Roberto won’t play as a full-back in the new season, as Barcelona have secured the signature of Nelson Semedo from Benfica. With Blaugrana’s new manager Ernesto Valverde already confirming that he wants to use the La Masia academy graduate in his favoured midfield position, the Spaniard fears that the arrival of Paulinho from Guangzhou Evergrande could limit his chances in the Starting XI. Apart from Paulinho, Sergio Busquets, Andres Iniesta and Andres Gomes are all considered as a threat to Roberto’s own chances of starting under Ernesto Valverde. The Catalonia-born player has already been linked with Europe’s top clubs like Man Utd, Chelsea and Juventus, and all three clubs are ready to pay his €40m release clause. However, report in Sport claims that Roberto is more interested in moving to the Premier League. Barcelona have already lost Neymar to PSG for a whopping price of £198m, and it shall be interesting to see whether they allow another player to leave Nou Camp this summer.